SEATTLE, WA--(Marketwire - April 2, 2010) - With eggs set to steal the show this Easter weekend, food lovers and "molecular gastronomists" alike are abuzz about the most cutting edge way to cook nature's delight: sous vide. A technique that involves cooking food in a water bath at a consistent, precision-controlled low temperature, cooking an egg sous vide yields results virtually no other cooking technique can accomplish, including the illustrious "reverse boiled egg," in which the yolk sets to a smooth consistency, while whites remain velvety soft. One of this year's biggest emerging cooking trends, sous vide is quickly making its way into the home kitchen lexicon, thanks in part to the recent launch of the SousVide Supreme™ -- the first water oven designed specifically for home use. Now, professional chefs and everyday cooks alike can easily experiment with this versatile and delicate culinary technique. "Cooking eggs sous vide is fascinating, because it is such a complex food item with layers of different proteins that firm up at different temperatures -- just one degree up or down can change the entire texture of the egg yolk or white," said experimental chef Richard Blais, known for his innovative food featured on "Top Chef" and "Iron Chef America." 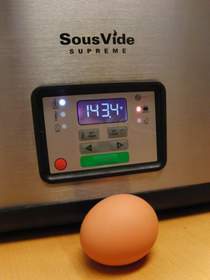 "Personally, using the SousVide Supreme, I peg the perfect egg cooked at 143 degrees Fahrenheit for 45 minutes. The yolk is creamy like a custard and the white is starting to firm but is still smooth and malleable. For both food and science lovers, it's quite an amazing thing to experiment with eggs and sous vide, because you can easily create new textures and see the chemistry behind it firsthand." Depending on personal taste, egg sous vide cooking temperatures typically range from as low as 142 (thick liquid-like yolk, and soft whites) to up to 166 degrees Fahrenheit or more (classic hard-boiled). Many early users of the SousVide Supreme have shared their own egg encounters via blogs, including Steamy Kitchen's amazingly beautiful creamy egg, Foodie Forkful's fabulous soft boiled eggs on toast, and Sleepless Foodie's adventurous truffled quail eggs. "My favorite way to cook eggs sous vide is scrambled in the French style, so it comes out more like a custard," notes Dr. Mary Dan Eades, co-creator of the SousVide Supreme™, who shares her mouthwatering French scramble recipe on the community site. "Simply whip eggs with a bit of cream, butter and salt, seal the mixture in a sous vide cooking bag (without vacuuming), cook sous vide at 167 degrees Fahrenheit for about 15 minutes, massage the bag, and you have a quick, delicious gourmet breakfast!" Developed decades ago in France, sous vide has long been used by culinary professionals working with expensive specialty equipment. Now, this emerging trend is gaining foothold in American households, fueled by the SousVide Supreme™. In addition to eggs, it is used to cook a wide variety of food, including meats, fish, vegetables, poultry, fruit and more. The method involves cooking vacuum-sealed foods (though eggs can simply be dropped in the water in their shell) in a water bath at a precisely controlled low temperature, typically for longer time periods than other cooking methods. Fans praise the style for its ability to improve flavor and texture and lock in nutrients, as well as perfectly cook foods from edge to edge, for fool proof gourmet results. For more "egg-citement," visit the SousVide Supreme blog to view a sous vide egg homage from around the Web, and take a deeper dive into the molecular science. For more information on the SousVide Supreme™, visit www.sousvidesupreme.com. Passionate about nutritious, flavorful foods, the Eades family and their research experts at Eades Appliance Technology LLC created the SousVide Supreme™. French for "under vacuum," sous vide is an extremely effective method of cooking whereby food is vacuum-sealed in airtight, food-grade pouches and submerged into a water bath at precisely controlled temperatures -- often at much lower temperatures than used in traditional ovens, but for a longer time. The patent-pending SousVide Supreme is the first consumer appliance to bring traditional sous vide cooking techniques to the home kitchen. A technique long respected by gourmet chefs for its reliability and improved food quality, sous vide can now be enjoyed in home kitchens everywhere, thanks to SousVide Supreme™. The SousVide Supreme™ is available online at www.sousvidesupreme.com.